(Trent Nelson | The Salt Lake Tribune) Law enforcement after a shooting at the Fashion Place Mall in Murray on Sunday Jan. 13, 2019. Murray • Police arrested two teenagers believed to be involved in a gang-related shooting at Fashion Place mall Sunday afternoon — and they’re continuing to search for others. Jesus Joshua Payan-Mendoza and Jorge Luis Crecencio-Gonzalez, both 19, were arrested early Monday morning in connection with the shootings of a man and woman outside the mall doors, said Murray police Officer Kenny Bass. The woman, who was shot in the leg, has been released from Intermountain Medical Center in Murray. The man, who was hit in the back, remains there in critical but stable condition after surgery. Both are members of a rival gang, Bass said. A probable cause statement said Payan-Mendoza and Crecencio-Gonzalez are involved with the “Florencia 13” gang. It’s unclear whether either of the two teens fired a gun during the attack, Bass said, but the documents say Crecencio-Gonzalez drove a getaway car. Both are being held on suspicion of attempted homicide and felony discharge of a firearm. Bass said Monday that members of the Florencia 13 gang “incidentally” bumped into members of a rival gang inside the Murray mall about 1:30 p.m. The two groups yelled at each other. And as one left, the other followed. The two groups then got into a physical fight outside a southeastern entrance of the mall at 6191 S. State St. The Florencia 13 gang members “turned and fired," hitting the man and woman, who are in their early 20s, police said. A member of the other group fired back, but it does not appear the individual hit a Florencia 13 member. With the exception of the two who were wounded — and police are not releasing their names — another eight to 10 gang members fled the area, Bass said. Police continue to search for those individuals, as well as any witnesses who have information or cellphone video of the incident. Officers are also checking security camera footage from the mall. An alarm was going off at the mall just prior to the shooting. Bass said that “had nothing to do” with the incident, but was part of an ongoing problem Fashion Place is having with its emergency alert system. Fashion Place management did not respond to requests for comment Monday. Neither Payan-Mendoza nor Crecencio-Gonzalez has a serious criminal background as adults. Both have a handful of past traffic tickets. They are from the Summit County or Wasatch County area, Bass said. 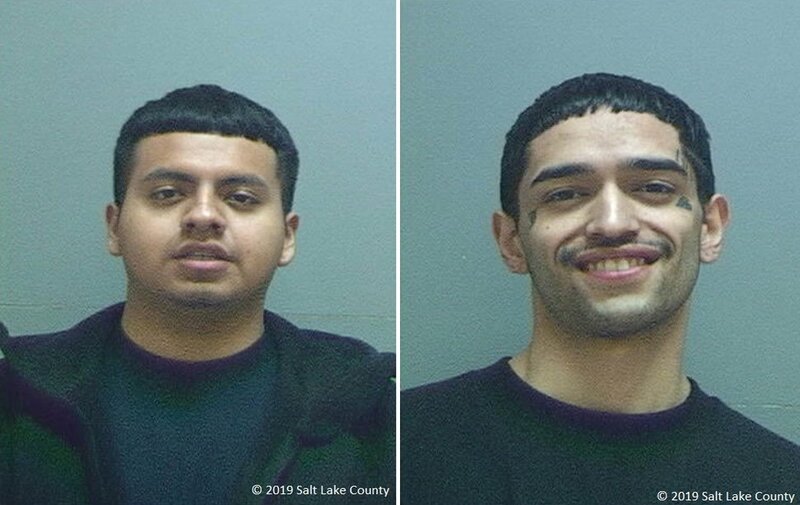 (Photos courtesy Salt Lake County Jail) George Luis Crecencio-Gonzales (left) and Jesus Joshua Payan-Mendoza. The Summit County Sheriff’s Office said Monday that the county has “a gang presence" — but it’s not considered a large problem. Wright said his office has spoken with Crecencio-Gonzalez before and arrested him twice on outstanding warrants — one in 2017 and the other in 2018 — for traffic violations both in Summit and Wasatch counties. The Wasatch County Sheriff’s Office referred questions back to Murray police. The shootout between members of the two gangs, Bass added, was an anomaly for Murray, too. Shoppers and employees ran in terror after hearing the gunshots. Many hid inside stores. 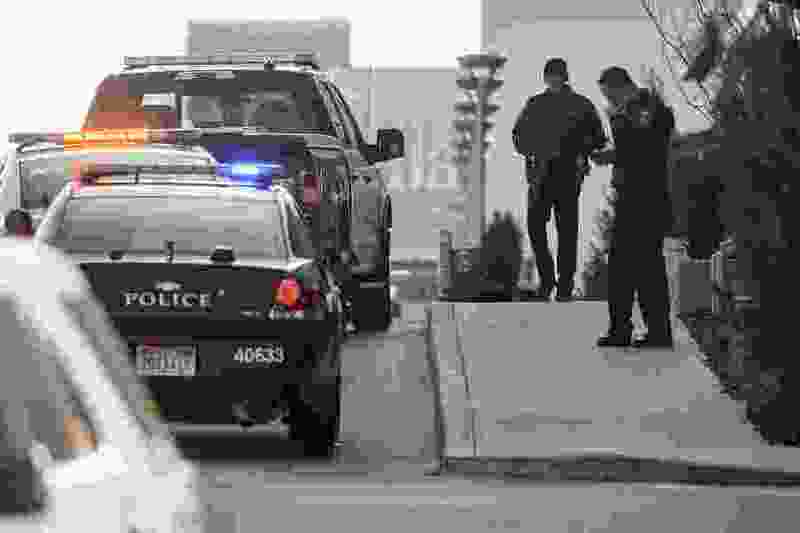 Although one mall worker described people being “trampled,” police said they had received no reports of any such injuries and Intermountain Medical Center said it has not treated any. When Marshall VanHook, who has worked for the Army for nine years, heard the gunshots, he ran toward them. He and his wife were at the mall to celebrate their daughter’s fourth birthday. The girl had just gotten her ears pierced and the couple was taking her to get a pretzel. They were about 20 to 25 feet away from the doors when he heard the gunshots and saw a bit of a flash, VanHook said. He pushed his daughter and wife to hide at the T-Mobile shop. Initially, he tried to chase down the shooters, hoping to at least get a description to feed to police, he said. But so many people were fleeing the mall, he said, that he couldn’t tell what was going on. So he ran back to the doors where the man and woman were shot. The sergeant and recruiter pulled off his leather belt and used it as a tourniquet on the woman’s leg. It appeared the man was shot in the leg and back, VanHook said, so he wadded up a T-shirt that someone handed him and applied pressure to the wounds. Surgeon Mark H. Stevens, the trauma medical director at Intermountain Medical Center, praised bystanders who “jumped right in to help” after the shooting. The two victims each arrived with tourniquets on their legs — one for the woman, both legs for the man. Things were back to normal — more or less — at Fashion Place mall by Monday afternoon. There was no sign of police presence, although employees said mall security staffers were walking around more frequently. The biggest difference was that Fashion Place was less busy than usual, they added. Wilson confirmed that the mall’s fire alarm had been going off at odd intervals for unknown reasons. “So none of the people inside were really worried about it. It’s just been going off at random times,” he said. Wayne Deppe acknowledged he was “a little bit” concerned about coming to work Monday. He wasn’t working on Sunday, but his boss was — and the eyewear kiosk where they work is close to where the incident occurred. At the top of his list of priorities is to be prepared if something like this happened again; he had not been trained in any emergency procedures. Shoppers who showed up on Monday afternoon — including a good number of parents with young children — were unconcerned. Kelisha Osborne and James Puckett didn’t consider changing their plans to do some shopping at the mall.